These gooey cinnamon buns make great breakfast rolls. What was my friend's response to these cinnamon rolls as we made them? "Disturbing," was her opinion. I would say they're disturbingly delicious: gooey, hazelnut-covered, buttery, cinnamon joy in a dish. Technically, they are hazelnut cinnamon rolls: It's a traditional recipe for gooey cinnamon buns with toasted hazelnuts added in. This cinnamon bun recipe worked wonderfully. It was easy and yielded better results than more elaborate cinnamon bun rolls I've made. She was disturbed by something else, though: the yeast. She was thinking through the dough-making process: first you put micro-organisms in bowl with their favorite food, let them get a little party started, then bake them to death and eat them. Yum? 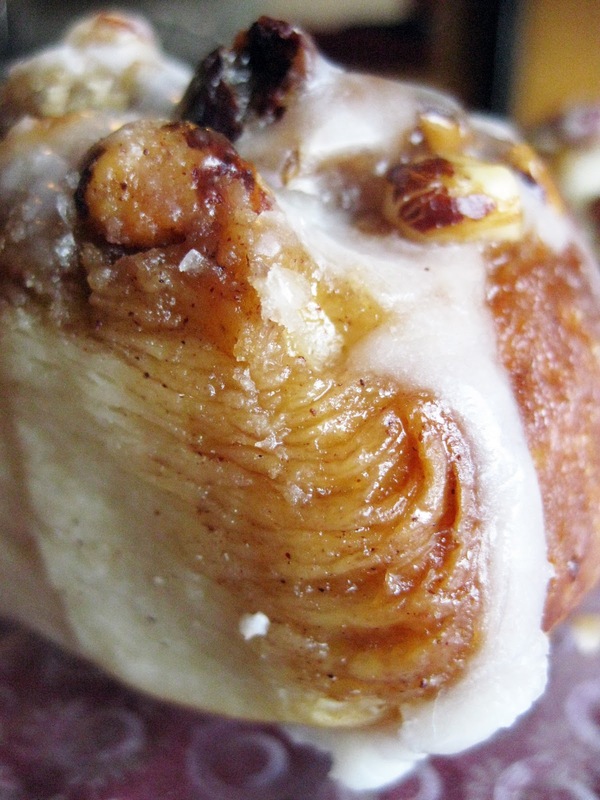 Put that way, gooey cinnamon buns are just dead micro-organism cakes. Mmmmm. Sorry if that just killed your appetite. Not for the faint (or clogged) of heart. BUTTER alert! I was getting a little grossed-out while we were dwelling on the topic. Luckily, it didn't take long for the mouth-watering aroma of baking hazelnut cinnamon rolls to erase those thoughts. If you want to make these, a 9x13 inch pan is essential because the buns bake in a bubbling ocean of butter and brown sugar. When they are done and slightly cooled, invert the pan onto a platter (another friend tackled that tricky procedure with finesse), and all that buttery brown sugar from the bottom of the pan becomes a gooey topping. Gooey cinnamon buns from the corner of the pan are my favorite. They turned out wonderfully. They were light and fluffy on the inside, and outshone more elaborate recipes I've tried that call for letting the dough rise overnight. I immediately snapped up a roll with a golden brown, flaky crust from the corner of the pan. Thank Allrecipes.com for this gem, found here. Make a glaze to drizzle over the finished product (powdered sugar with just a little bit of maple syrup and milk). The recipe might be a little short on flour - I had to add about a 1/4 cup extra before my helpers and I could knead it - but that is probably because I wasn't careful enough when measuring the flour initially. Using the recipe above, I substituted the pecans for toasted hazelnuts. Ha ha ha...thanks, Lia! :) I can't tell you whether or not there is a secret cape involved, but I also have a lot of hungry friends who help make the food disappear. Without them, baking wouldn't be so much fun!